Where I live the rain and wind are beginning to knock leaves from the trees. Dramatic, daily change in the natural world is exciting, especially if we are lucky enough to have warm homes to shelter us. Just like the mirror season of spring, fall loudly demonstrates to us that we live in dynamic cycles, miraculous cycles of life, death, and rebirth. I feel more alive and aligned with the natural world when I see these cycles in my life too. There are times I want to be a fall leaf and let go of what I’ve been holding too long and fly with the wind. Are you enticed by this opportunity too? I suspect a bit of this excitement stems from the current fire energy (a grand fire trine of Mars, Jupiter and Uranus) sparking our readiness to change. I also suspect that if we allow ourselves to align with natural forces, we know better how to respond with anticipation to inevitable change. We are in Libra’s season of Balance, and nature is putting on a balancing show for us. The wind and rain are tools of this balance. Spring’s emergence has given way to winter’s retreat. This is inevitable. This is life. Shifts happen this week that may feel like strong winds blowing through our lives, asking us to accept balance. Mercury has just stationed retrograde. This period of changing direction is potent. As the psychopomp, Mercury provides a direct link between the world of the living and the world of the dead. In this role he performs a great balancing act between these ultimate states. During this retrograde, the veil between worlds is thinner and we can’t rely on old assumptions about how these realms work or are communicating to us. In other words, though Mercury will undoubtedly bring the usual frustrations around communication and travel, keep an ear open for deeper messages. Whether they come from our souls, our ancestors, or our living partners, these communiqués are potent. Mercury will station direct on October 25. Another mythic figure (the sky if full of myths!) plays a significant role the next couple of weeks. Venus in Libra has disappeared from the sky. The reason, Venus is coming into a superior conjunction to the Sun (exact on October 25 as well). This means that Venus is on the far side of the Sun from Earth’s perspective and can’t be seen at all. The Sumerians saw Venus as their goddess Inanna. When Venus would leave the sky, they told the story of Inanna leaving the earthly realm to visit her sister Erishkegal in the underworld. This story, being enacted by Venus and the Sun is another connection to the underworld during this season of Balance. In addition, on the day of the Full Moon on October 8, Venus will be square to Pluto, the lord of the underworld. Venus, as the ruler of Libra, is the sovereign of balance. Repeated in these transits is a strong recurring message about the balancing forces of life, death, and rebirth. If I open to that force, how might I be better prepared for the changes coming my way? Another significant influence this week is the Lunar Eclipse at the Full Moon. [Times for seeing the eclipse can be found on EarthSky. An eclipse signals a brief but uncertain time when we can experience sudden change. It isn’t always that the change is unwanted but there is a need to rapidly adjust to it. This Libra lunar cycle,* which at the very least invites us to observe the influence of balance in our lives, culminates at this Full Moon with an experience of riding the balancing waves with as much Libran equanimity as we can mindfully achieve. Sunday, October 5. Even the subtlest signals have an impact on our mind/bodies. With the Moon in Pisces, our senses are more finely attuned to emotion and energy. One way to support this enhanced awareness is through slowing down and listening to what we really need. This may mean you have to change your plans, or ask for help, or give yourself permission to be more vulnerable. We all are today. The Moon makes a favorable contact with newly retrograded Mercury (both in water signs). Tune into the odd, unexpected messages from your intuition. Listen for ways you can better align with the balance forces of nature or answers to a question that has been puzzling you. We may become too spacey or lost in fantasy with the contact between the Moon and Neptune. The grounding cord may come from Pluto’s unwavering gaze into our shadows. How do you balance your disappointments with your highest ideals? Monday, October 6. The morning (CDT) could start off with impatience and frustration. The square between the dreamy Moon and Mars in Sagittarius is lowering our inhibitions. If you are mad, others will know it. With Mercury newly retrograde, which means the world is adjusting to this new influence, take extra care getting to work. Give angry drivers a wide berth. The afternoon is more stable. Notice how good boundaries help you with keeping emotional balance today. Tuesday, October 7. Tomorrow’s Full Moon Lunar Eclipse in Aries is already being felt. Aries, the sign opposite Libra, where the Sun and Venus reside at the moment, is pulling against the Libran desire for equilibrium. Aries dashes forward. Libra adjusts for any wake created by this action. Notice the times you want to compensate for big emotion. Notice how you may want to soothe the waters. “Either/or” thinking doesn’t seem to help. Where do we find the gracious way of being, the “yes/and way”? The Sun opposes feisty Uranus elevating the impetuous energy of the Aries Moon. Balance and forward momentum are having a conversation. Hopefully it will be productive in helping us make change with gracious regard for others. The Sun makes a paradoxical aspect with Chiron. This looks like the contrast between detached equilibrium and empathetic compassion. The Libra Sun can help us get perspective on wounds if we are willing to step back dispassionately. The Moon contacts Venus and Pluto activating a plunge into relationship dynamics that could feel intense. Passions are aroused. Fall winds are blowing through. Some of this disruption can be cleansing. But watch out for words or actions that can’t be taken back. If you want to see the lunar eclipse early tomorrow morning (CDT) go to EarthSky to see when it will be visible pre-dawn tomorrow. October 8—Full Moon: Illuminating. Lunar Eclipse. I walk the patterns of the stars, my destiny is Mystery, I hold tomorrow in my hands, this light I give to you. These are words to a chant I learned years ago in a ritual. The eclipsed Moon in Aries today reminds me of holding my candle as we sang these lines under the dark trees of a magical place in Missouri. We’d pass our light on to another person when we sang the last line. At this Full Moon I am reminded of the feelings of holding tomorrow in my hands and sharing it with others. Sometimes this is a simple and clear directive—I know what my light is, I know what I’m sharing. Other times, darkness seems to take over. It takes faith to keep walking and keep passing the hope when we encounter challenges along the way. In an eclipse, the Moon’s light disappears and for a moment we can be left feeling that the path before us has been darkened too. Then the light comes back. The path that is illuminated may be quite different, but we still hold tomorrow in our hands. We still walk the pattern of the stars. 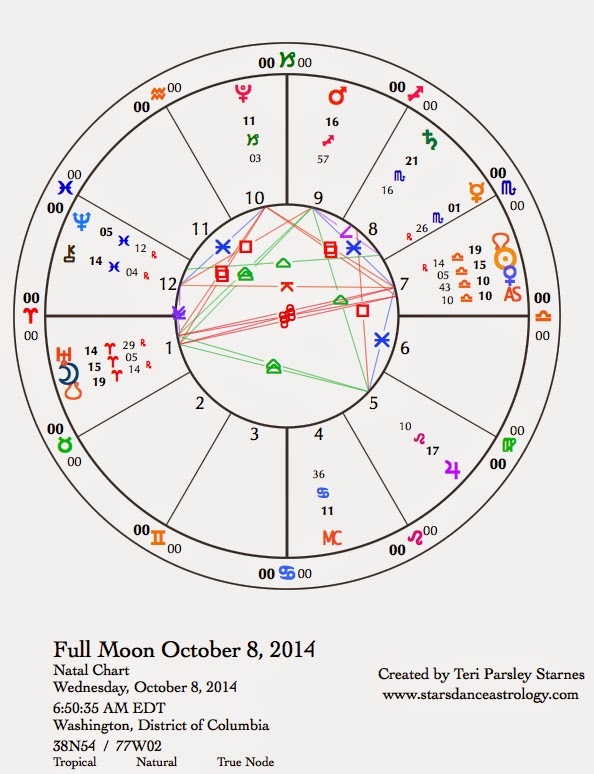 The theme of tomorrow’s hopes burns through and through this Full Moon chart. The Aries Moon is less than one degree away from Uranus, the planet of awakening. Uranus says waking up in the present will impact our tomorrows. Uranus says the only way to a better tomorrow is to take the courageous and sometimes foolish leap into the next moment. Dare. Uranus has been giving us a steady message about Aries daring since entering that sign in 2011. Have you felt it? This Full Moon literally puts a fire under us to wake up, to act, even if the light seems to falter from time to time. There is a very dynamic grand fire trine in the chart. Mars in Sagittarius, Jupiter in Leo and the Moon and Uranus in Aries are feeding the flames. Fire illuminates the tomorrows we want to have. Fire can be expansive—with Jupiter’s help even more so right now. What happens when this expansive fire contacts the shadow side of an eclipse? The square between Venus and Pluto emphasizes these shadows and invites us to truly manifest the power of beauty and balance as we face the darker elements of life. Pluto heightens our appreciation for deep beauty the same way Death heightens our appreciation for Life. Interlocking aspect patterns—a t-square and a grand fire trine that is really a kite pattern—present a complex mingling of energies. Our tomorrows are complex too and fraught with potential for amazing shifts and dire consequences if we fail to come back from the darkness with a light to share. Thursday, October 9. Although the light may have felt lost to you yesterday, there is good reason to expect that you will find yourself on sure footing again today. The Moon in Taurus has us finding a solid foundation again. What a relief. The challenge may come from travel/communication mix-ups as the Moon opposes retrograde Mercury in the morning (CDT). The Moon’s contact with Neptune increases our desire to empathize with others but not to the extent we lose track of our own needs. Friday, October 10. Mercury retrogrades back into Libra today. Moody obsessions may lessen as we rethink our partnering patterns. Partnership is a metaphor for Balance in the Libra worldview. What are you noticing about balance right now? What are you noticing about your choices? The Sun is sextile Jupiter infusing the day with optimism and a desire to expand. Jupiter’s transit through Leo reminds us to have fun, take creative risks, and share the light of self-appreciation. Today would be a good time to try any of that. Towards evening (CDT) things get a bit more serious, which is OK. The quincunx between Venus and Chiron reminds us that even when we are brilliant, we can still feel vulnerable. That is OK too. October 11—Disseminating Moon: Sharing. Emma Goldman has been attributed with saying, “If I can't dance, I don't want your revolution!” Venus opposite Uranus today modifies this to, “If it isn’t exquisitely beautiful, I don’t want your revolution!” The Venus notion of beauty is elegant. It appreciates simplicity and clarity and insists upon fairness. How can you add these qualities to your revolution? This phase of the Moon has us accessing what we are learning and what we want to teach. The Moon in Gemini goes along with this notion very well. What are you learning about the balancing forces of nature? What will you share?